That’s just my view of course, but I had a rare chance to visit and see Colesbourne Park for myself, just a few days before it officially opens for the first of their celebrated snowdrop weekends in 2016. Visitors are in for a treat! Snowdrops don’t thrive in my sweetheart’s part of the world. As a youngster, he never acquired the snowdrop bug that rarely fades where it finds fertile soil. For him, each snowdrop doesn’t embody the whole of the new flowering season in its tiny frame, or symbolise optimism in the midst of winter, as it does for me. But, out of professional curiosity, suppressing a smile at my obvious excitement, he agreed to join my quest to see thousands of small white, bobbing, ankle high things. I’m not a galanthophile though I’ve written before of my relationship with an old snowdrop catalogue. I do have a passion for all kinds of flowers. If you spot me in a garden, I’ll be crouching down to examine them, perhaps turning their heads to face me so I can compare their colours and markings. Almost certainly I’ll be trying to capture their transient beauty with a camera. And that’s how we got to hear of Colesbourne Park. Some kind ladies at the nearby Rococo Garden noticed our interest in snowdrops (I was trying to photograph one with a ladybird on it) and stopped to ask us if we’d seen the wonderful collection of varieties at Colesbourne. We hadn’t – then – but we’ve put that right since. For as soon as I heard about Colesbourne’s collection of 250 different types of snowdrops with their stripes, splashes and unusual patterns, I knew it was just what I needed to exercise my inner plant nerdiness. These are snowdrops with a fine heritage. The collection was started by Henry John Elwes over 130 years ago: a natural historian and RHS Victoria Medal of Honour winner born at Colesbourne, who eventually inherited the estate. Several plants were named for him, including Galanthus elwesii, a large snowdrop he discovered in Turkey. Galanthus elwesii ‘Yvonne Hay’ is a large, vigorous variety with striking, green, heart shaped markings. Today his great grandson Lord Henry Elwes and his wife Lady Carolyn, with their gardeners Chris Horsfall and Will Fletcher, lovingly tend and multiply the collection, adding new cultivars bred at the estate, as well as purchases, gifts and exchanges from other enthusiasts. We counted ourselves very fortunate to be invited by Head Gardener, Chris, to have a sneak preview of the gardens – and even more so when a smiling Lady Carolyn stepped out into the garden to meet us. Plant breeding fascinates me, so I asked Lady Caroyln about the varieties bred at Colesbourne. She explained that the garden is in a windy area, and foraged by a large population of bees, so most of the crosses occur naturally. Like my much-loved mentor David Austin, she has a particular interest in double flowers, though on a much smaller scale! Doubles often have no ovaries to speak of, but the pollen is fertile. Snowdrops take three or four years to flower from seed. One of their challenges is to keep on top of the naturally occurring seedlings and watch out for the more interesting ones. She pointed out a new variety named for a Colesbourne man, Galanthus ‘George Proverbs’, given a prize place in the garden. I hadn’t realized that snowdrops are scented. As with all fragrant plants, some varieties’ scents are much more powerful and alluring than others. Galanthus ‘S. 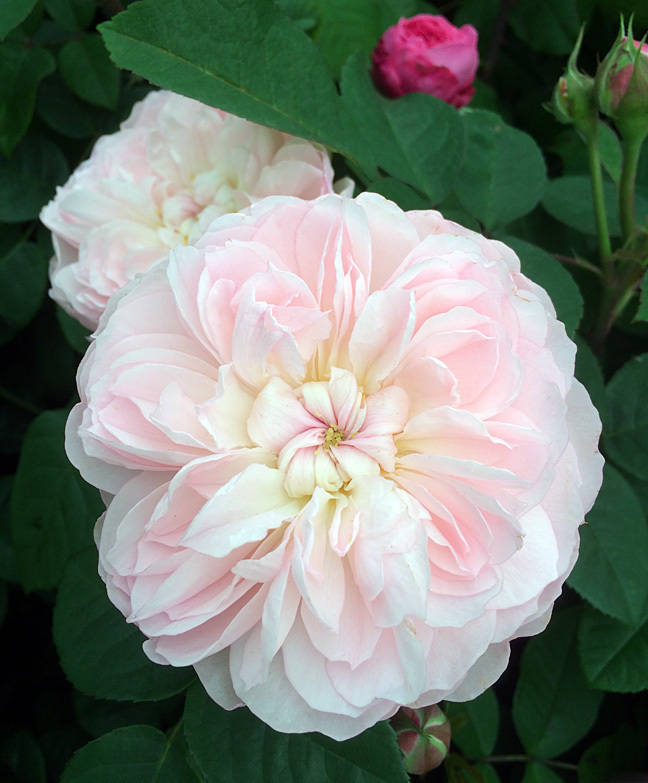 Arnott’, one of the most fragrant, is grown in a mass planting in an area called The Arnotts. It’s a vigorous, attractive variety. Their open day guides had to stop praising its sweet, honey smell when they saw how much trouble visitors were getting into, manouvering their noses down almost to floor level in sometimes icy conditions so they could sample the fragrance for themselves. The hillside planting of ‘S. Arnott’ is one of the best adverts for regularly lifting and splitting snowdrops I can imagine: Lady Carolyn told us they can all be traced back to a single clump she found years ago under a bramble. The woods and gardens are also home to large drifts of Galanthus ‘James Blackhouse’ and the early flowering G. plicatus ‘Colossus’. Realising she was dealing with enthusiasts rather than experts, Lady Carolyn explained that the leaves of a snowdrop make a great place to start if you want to identify them. She showed us the bend in the plicatus leaf, comparing it with the wider leaf of the elwesii with its waxy bloom; the slender leaf typical of nivalis; then the large leaf of the woronowii which almost overshadows its relatively small flower. One labelled Galanthus ‘White Swan’ particularly appealed to me. This graceful double seemed to have broad white streaks down the centre of each leaf. I believe it is the one shown from three angles at the top of this post, but I can’t be sure. I think of snowdrops as shade plants, but Lady Carolyn says they appreciate some sun in England during the growing season – dappled shade or the edge of woodland is ideal. The soil in the display border looked in great condition – there is no more attractive soil to me than that of a rich, fertile, marginal woodland. The border is apparently only shallow, but maintained by regular, generous mulchings. The plants are clearly thriving. One of the lovely things about this winter garden is the use of companion plants, to show off the snowdrops to their best advantage. These included hardy cyclamen, crocus, hellebore, painted arum, winter aconite, smaller daffodils and iris reticulata and histrioides. I spotted clusters of epimedium leaves but we were too early for their graceful, spidery flowers. I’m curious to know what is the lacy foliage we can see emerging in this clump of silver leaved cyclamen. By this point, my sweetheart was starting to warm to the charms of snowdrops and I distinctly heard oohing and aahing over the ones that caught his eye. With his permission, I’m sharing a few shots he took that I missed of these yellows. He also took my opening shot. Surveying the clumps of prized specimens in the Spring Garden, he announced that he couldn’t decide whether he most wanted to smother them in chocolate or butterscotch sauce before eating them (he’s a recovering ice cream addict). Lady Carolyn said he’d have to wait a few months for that, forbearing to point out they are poisonous if eaten. It was probably getting time for us to leave! In the courtyard garden, she pointed out the ethereal flowers of a Japanese apricot tree (the early flowering Prunus mume) running along bare branches, creating a very pretty effect above the snowdrops and against the brickwork. It’s an extra treat when the tree’s flowers coincide with snowdrops, as they have this year. The red twig dogwood and variegated yucca made another great combination. Snowdrops with iris, bergenia, lavender, red twig dogwood, variegated yucca and golden euonymus. Snowdrops are adaptable plants. They can speed up development of the slender stems (pedicels) that hold the flowers to take advantage of mild conditions, or slow down growth in cold spells. The flowers’ outer petals close in slightly if inclement weather arrives to help conserve the pollen for more balmy, bee-friendly days. The mild winter has encouraged the snowdrops to flower early – perhaps by as much as three weeks. It won’t affect this garden much – snowdrops are long lasting flowers and the sheer range of species snowdrops and cultivars at Colesbourne extends the season of flowering further. There’s certainly no need for visitors to hold back a week or two to see the flowers at their peak – the snowdrops were in tip top condition and will be looking superb this weekend when the garden opens. I hope these pictures convey a little of the sheer variety of the snowdrops on display. Galanthus elwesii ‘Rosemary Burnham’ (above) may be demure, but to my mind it’s one of those head-turning plants I’ve mentioned before. Lavish green streaks on the insides and outsides of the three outer petals (technically tepals) beautifully offset the bold green inner ones. In contrast we saw a pure white variety I would not have believed was a snowdrop if Lady Carolyn hadn’t been at my side to assure me it was. Apparently some people prefer them. Though we explored the courtyard and the display garden where clusters of prize snowdrops mingle with other woodland plants, we didn’t explore the woods or George’s garden. I left wanting very much to return. But isn’t that how we should always feel whenever we sorrowfully turn to leave a great garden? Visit colesbournegardens.org.uk to find out more about the gardens or order snowdrops for collection. 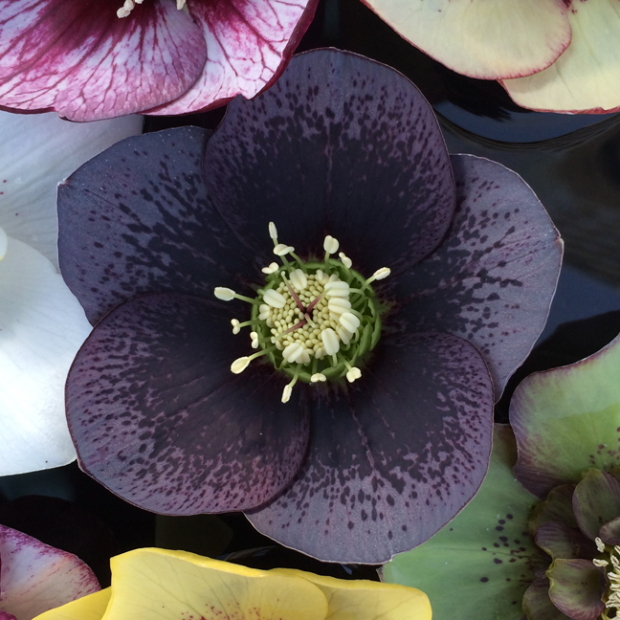 The gardens are open weekends only from 1 o’clock between 30th January and 28th February 2016. Last entry is at 4.30. Please double check details on the website before travelling. American readers might like to know that Lady Carolyn is giving a lecture about Colesbourne Park at Winterthur Garden in Delaware on 12th March 2016, as part of the Bank to Bend event held to celebrate the early bulb display (see the Winterthur website for details). I love winter gardens and am always sorry that so many gardens are closed at this time of the year. If you know of anywhere you’d suggest is a strong contender for the title of best winter garden in the Cotswolds, please let me know. I’ll gladly add it to my to-visit list – any excuse to visit the Cotswolds is always welcome! P.S. I almost forgot to link in to HeyJude’s January: Winter Gardens challenge. As she inspired me to find a really interesting winter garden to photograph, that would have been a pity. Please check out the other entries if you have a moment. I don’t know if you noticed but they have a snowdrop themed cryptic crossword on their website. What beautiful photos! The first photo of the double blooms makes them look like enameled jewels. I love snowdrops but they don’t grow well here. And the silver-leaved cyclamen — gorgeous. 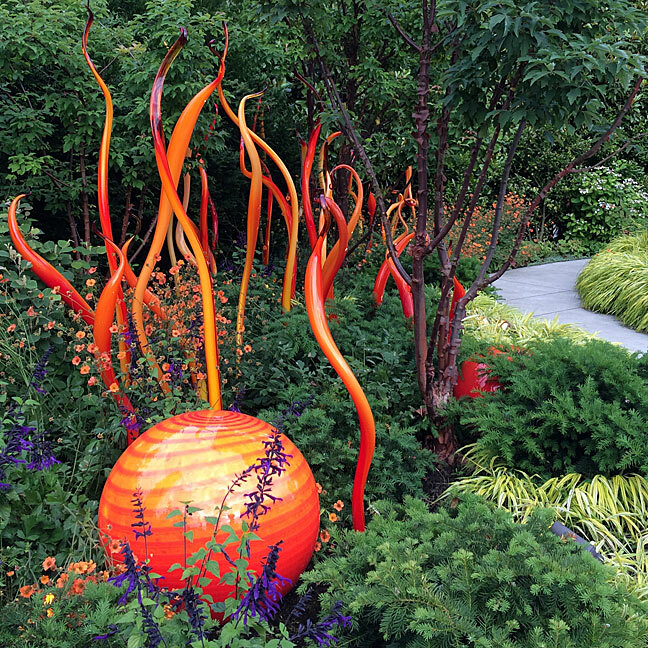 I will have to add this garden to my wishlist of places to visit! The cluster of silver leaved cyclamen was one of the highlights for me. This was a delightful post, especially since winter is still very much in force here and we won’t be seeing any blooms for 6 weeks or more! What an unbelievable garden! I haven’t seen many snowdrops locally yet, though we won’t have long to wait. I’d say we’re at least a week behind. I am very jealous of your visit to Colesbourne. Some day like all galanthophiles I hope to make the pilgrimage but for now I am too busy at the nursery with my own snowdrops. I am glad Felder got the Winterthur information to you and hope any Americans who read this will make the effort to attend. The March Bank is not to be missed and the lecture should be wonderful. I hope you’ll find a way to make your pilgrimage. It’s a tug of love for nursery people to balance the needs of caring for their own plants against the natural instinct to explore other collections. We enjoyed a nice walk around Winterthur several years ago when many bulbs were flowering after visiting the Philadelphia Flower Show. It’s a lovely part of the world. That is a splendid selection. That pure white one looks pretty massive. Thanks for the info. It does, doesn’t it? I do remember it being a large one, but the macro and tight crop is making it seem even bigger. Snowdrops are elegantly pretty little flowers, and those doubles are doubly so. How beautifully expressed – I agree! I had no idea there are so many kinds of snowdrops! And each of these is delicate little beauty. It’s one of those plants that cross very readily. And I’m sure the plant gets extra focus from gardeners and breeders because it flowers so early. Beautiful. I am new to the world of snowdrops but I do have Jacquenetta.. My one and only ‘special’! I love to see them en masse, creating drifts of the wild ones around the garden here is a must for me over the years to come. That seems like an excellent choice to me! I didn’t get a picture of the drifts at Colesbourne, as we didn’t explore that part of the garden, but I have a few taken at the nearby Painswick Rococo Garden. Oh lucky you, I would love to visit this garden. I am a sufferer of White Fever myself and just can’t get enough of the little darlings. Lovely photographs. The lacy foliage amongst the cyclamen looks rather like cow parsley to me, but on the other hand it could be corydalis. I don’ t know what’ s taken me so long to find your lovely blog. … or me to see this – must be some kind of conspiracy! Beautiful article/pics – particularly liked the one of the drifts of cyclamen with the snowdrops in the background.